Book review by Simon Enoch. 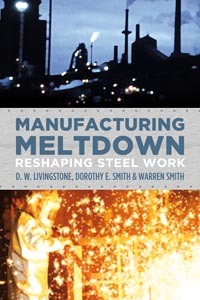 I approached the new Fernwood release Manufacturing Meltdown: Reshaping Steel Work by D.W. Livingstone, Dorothy Smith and Warren Smith (Fernwood Publishing, 2011, paperback: $27.95) from a rather different perspective than I approach most other historical works. Manufacturing Meltdown details over thirty years of research into the steel industry in Hamilton Ontario, my hometown. As the son of a boilermaker, growing up in a working class community and surrounded by the families of steelworkers throughout the late 1970s and 1980s, the material in this collection is particularly poignant as it revealed to me the driving macro-economic factors that shaped many of the events that characterized my childhood. David Livingstone’s solo contribution to the book, “Melting the Core Workforce, 1981-2003” was particularly useful in this regard as it describes the many factors that contributed to the steel crisis that seemed to grip Hamilton throughout much of my early memory. The downsizing and restructuring that Livingstone painstakingly details as Stelco tried to remain competitive in the global marketplace during the 1980s explained to me the larger forces at work that created so much anxiety in my neighbourhood. Reading through Livingstone’s account, I was reminded of my daily conversations with friends about Stelco and the fate of their fathers’ employment. Even at a rather young age, my friends knew where their fathers’ stood in regards to seniority and whether they had enough years served to hopefully protect them from lay-off. Those whose fathers’ had been laid off would know the exact number of weeks remaining on their Unemployment Insurance benefits and they would all endlessly hope for that magic word “recall,” which would return their fathers back to work. It was these thoughts that for me animated Livingstone’s account of the steel industry in Hamilton during the 1980s. Certainly it is an exhaustive account, more than can be summarized in a brief review. However, I think Livingstone’s emphasis on the shifting work practices and pressures brought by management to restructure Stelco’s Hilton Works with an ever-shrinking workforce and the resistance of workers to management dictates that they intuitively knew to be an attack on not only themselves, but on the quality and dignity of their work is a fascinating example of the dynamic of class-conflict played out on the shop-floor and within the work process itself. Indeed, as with many other critical accounts of the labour process, it is always inspiring to witness the degree too which workers possess an intimate knowledge of their jobs and their craft. Dorothy Smith and Stephan Dobson’s contribution to the story of steel work in Hamilton provides a detailed look at how workers learn and transmit skills in the workplace and the community. If Livingstone offers us a macro-economic look at the steel industry in Hamilton, Smith and Dobson bring us back down to the micro-level, revealing the ways in which experiential knowledge is acquired and disseminated among the working class. Smith and Dobson illustrate how the historical processes of skills transmission within the working class have increasingly been appropriated by management and effectively “outsourced” to state education institutions as part of the overall process of “credentialization” that has become so endemic within the contemporary labour market. As Smith and Dobson argue, this process of appropriating workers’ knowledge for the benefit of management not only allows for tighter management control over the work process, but effectively disempowers workers as control over these skills and knowledge allowed workers a modicum of job security and protection. Smith and Dobson’s in-depth discussion with individual steelworkers provides us with a window into the hidden socio-cultural practices of working class communities and demonstrates the deep knowledge that workers possess. Their interviews provide a powerful corrective to common-sense assumptions that industrial workers are mere “automatons” with little skill and no knowledge of the work process. This in itself is an important, but unfortunately much neglected, insight into the skills and learning that working class people acquire both on the shop floor and within their families and communities. While it is usually unfair to criticize a work for what was left out, I would have liked a consideration of how class-consciousness and trade union consciousness are transmitted from older to younger workers added to this section. Given the access the researchers had to individual steelworkers and the candid nature of the workers responses, it seemed an opportune venue to explore how these workers view the economic system and their place within it. That being said, much can be discerned from the voices of the workers themselves, although it would have been a welcome addition if the authors could have brought their considerable insight and knowledge to this question. The final section of Manufacturing Meltdown addresses the future of steel jobs in an era when one could be excused for not seeing much of a future for the steel industry in Canada given recent events. Summarizing the sordid details of the recent bankruptcy at Stelco and the “graying” of the remaining workforce, the authors acknowledge that the steel industry faces many challenges in the years ahead. The authors remain cautiously optimistic however, pointing to alternative models of worker self-management and sustainable development as the way forward. Many of my childhood friends aspired to follow in their fathers’ footsteps and become steelworkers themselves. Hopefully if the authors’ vision comes to pass, steelwork can be restored as a dignified, high-paying and highly-skilled occupation, rekindling those aspirations among Hamilton’s youth. Simon Enoch is Director of the Saskatchewan Office of the Canadian Centre for Policy Alternatives. A Hamilton native, he holds a M.A. in Work and Society from McMaster University and a PhD in Communication and Culture from Ryerson University.